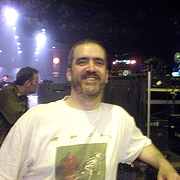 David at a Rush gig! I discovered rock music as a teenager. In particular, I discovered Rush when a friend brought A Farewell To Kings into school one day. (We were allowed to play records in Art.) I was hooked and it was the next album I bought. It was one of the first five albums I bought and is still one of my favourites. I have consistently failed to learn any instrument past a basic level of incompetence. Currently, I am failing to play the guitar. I teach Computing in a secondary school in Glasgow and don’t get out to as many gigs as I would like. Preferred Genres: My official position is that I don’t like the way music gets fragmented into genres and sub-genres. If pushed, I make the smart-alec comment that are only two types of music: good music and bad music. If pushed again, I make an attempt at humour, adapt a joke from the Blues Brothers and say I like both kinds of music: rock and roll. If you really, really push me, I will very grumpily murmur something like: rock, prog and the blues. There! You made me say it. I hope you are happy now. Favourite Bands: Rush, Peter Gabriel, AC/DC, Joe Bonamassa and Black Stone Cherry. Favourite Venue: The Glasgow Apollo (sadly, long gone). Favourite Drink: Tea (one milk, one sugar, stir anti-clockwise please).